The itchy sensation from fabrics results from our skin being irritated by the ends of the fibers which make up the fabric; it is similar to being lightly pricked by many tiny needles. (E = Young's modulus[stiffness], I = moment of inertia [= pi/64*diameter4 for circular rods], L = length of fiber protruding from fabric), has been identified as the dominant parameter for causing the "itchy" sensation ; higher P_E means an itchier fabric. From this expression, we can see that fabrics made of stiff (high E), thick (large radius -> high I), short (lower overall length will limit the protruding length L) fibers will feel itchier. If you look around at the properties of various fabrics, you should find that they follow these trends. As an example, a wool used to make carpet has shorter fibers and fiber diameters of ~40 µm. Carpets, correspondingly, are quite coarse and itchy. 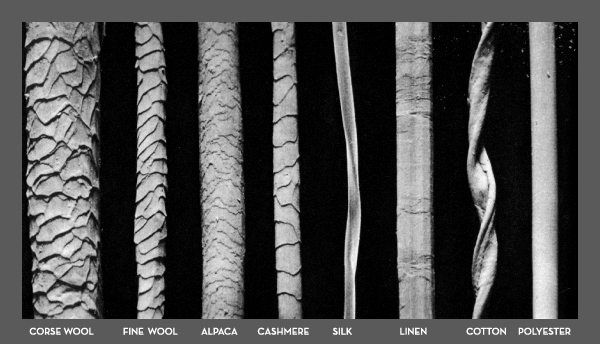 On the other hand, a high quality Merino wool can have a fiber diameter of 20 µm or less, and is soft and comfortable. Microfiber cloths are made of synthetic fibers that are even finer, less than 10 µm, and are very soft. Another aspect to consider is the roughness of the surface of the fibers. Fibers with rough surfaces will prevent the movement of surrounding fibers, reducing L, and can also act as additional short protrusions that prick skin and cause irritation. Here is an image of several fibers under a microscope. Coarse wool is indeed very rough, while fibers that are considered very soft not itchy (e.g. cashmere, silk, and the synthetic polyester) are very smooth. Great question. Wool comes in many varieties, and it depends not only on the animal it comes from, but also where the wool is cut from off that animal . Chemically, wool is mostly protein (called keratin) as well some animal fats, so you can imagine how every animal has specific needs (goats vs sheep vs rabbits) that will make their wool different from one another. In regards to why wool is itchy for some people, it is usually because it is one of the "lower quality" wools, which are usually cut from a more brushed up against/used area of the animal (think soft shoulder/neck vs rough front legs/tail). These different areas of the body of the animal have potentially lots of dirt and other organic matter (gross) and will also have a different chemical composition. This is because the wool is needed in different ways on the animals body, just like how human hair varies. Hair on someones head can be way different from the kind of hair they have on their arms/legs, and that is made possible by different protein to fat ratios. To summarize, tough, itchy wool usually comes from a heavily used/dirty part of an animal that can have rough wool, and will usually be pretty itchy to most people because its more coarse (from animal use/chemical composition). If it varies from person to person what they find itchy, well, that's because people like different things. Wool is almost pure protein. Cotton is cellulose, which is made from sugar molecules. Wikipedia says wool causes an allergic reaction in some people. When I was little and wore a wool hat that tied under my chin, I used to get a sore red spot under my chin. I think a big difference with synthetics is that stores wouldn't sell synthetic materials that made us itch, so they only sell synthetics that don't make us itch. Synthetic fibers are also pure in ways wool isn't so pure. Wikipedia says wool has a few percent fat, along with the protein. Wool is animal hair, normally made from sheep. I don't know what makes it itchy for some people. It may have to do with static electricity: for me, wool on my head (where my hair is) is itchy, but not in contact with other parts of my body.